Book bloggers are very interesting specimens. Mostly we’re nice and chatty and flail about books and haunt Goodreads all year round. But, just like any creature, making a book blogger furious is a BAD IDEA. If you value you’re life, don’t do it. We have 600-page hardcover novels on hand. HELLO. Would you like to have one flung at your head? Always be nice to a book blogger. Some even bite. No wait? That might be just me. 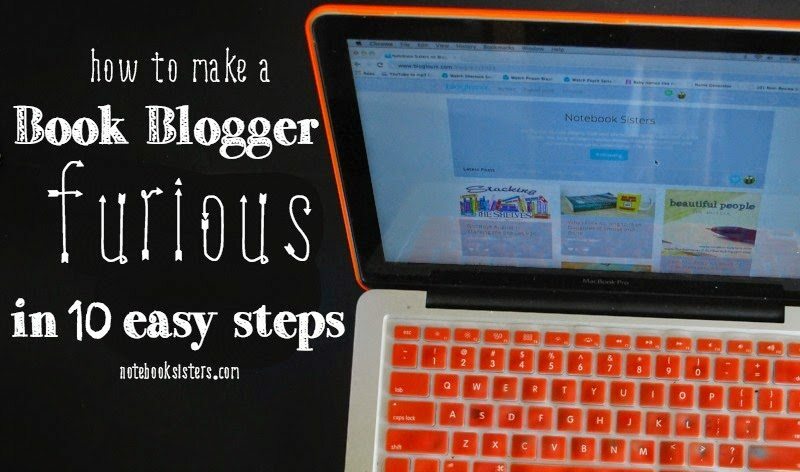 But, if you would like to enter the book blogger’s habitat and make them furious, I have a list (as I do) of just how to go about it. R.I.P you, though. 1. Tell them their opinion is wrong. This gets me every single time. How on earth can an an opinion be WRONG?! I…I’m baffled. I have honestly had people tell me, flat out, that I reviewed a book wrong. Everybody is different. THAT FACT IS NOT ROCKET SCIENCE. I expect to disagree with people about bookish opinions, but that doesn’t make either of us wrong! It makes us either a) intelligent because we have an opinion on a topic OR b) cantankerous and most likely enjoying playing devil’s advocate. Please, don’t ever be option b). 2. Ignore their “no review requests” sign and ask them to review your book. The funny thing about some authors is…they can’t read. Okay! I’m being mean. I apologise. But really, is it that hard to understand the phrase “no”? If I say “I do not take review requests” and you send me a review request. There is a 100% chance I will say no. BECAUSE YOU DON’T RESPECT MY OPINION NOW! 3. Spread their email addresses around. Yes my email address is easy to access. It’s on my blog. But this doesn’t mean you can just add me in a group email with 2 million other bloggers. Privacy is still a thing, you know. Educate yourself and BCC. 4. Leave spammy self-promo comments. “I haven’t heard of these books but I hope you enjoy them. My blog.” That’s not a comment. That is spam. Look, I get it! Figuring out an awesome comment to leave is hard. I am queen of leaving a) weird, b) eccentric, c) rambling comments. Sometimes mine are super short and just say I enjoyed such-and-such book and this part was my favourite. The thing with the spam example means you actually have nothing to say but you want a comment back. Don’t. If you don’t have anything to say: DON’T SAY ANYTHING. Stealing is stealing. You never have a good enough excuse for it. And original memes or bloggish ideas are actually insanely hard to come up with. INSANELY HARD! I nearly cried with tender happiness when I finally put a name to my Honest YA series. It’s the only original thing I’ve created over the blogging years and it’s kind of precious. I would be devastated if someone used it. But seriously, don’t freak out! If a blogger invites discussion, like “my top blogging pet peeves” then you can totally do a spin-off post. (It’s often nice to ask the blogger first, though.) And there’s no copyright on topics. I’ve seen bloggers post about a topic and I found out I had a big opinion about it. So I drafted the post and let it sit for a month or two, then posted mine. I’m not copying them in anyway. My opinion is voiced differently. My angle is different. I’M GOOD. And if a blogger has a particularly cool “series” going…ask them if they’ll make it into a linkup! You never know! They just might. Just don’t steal ideas. Credit people. Ask permission. And if you’re not sure whether something is stealing or not…it probably is. 6. Say they’re greedy since they own books and don’t read them all. Confession: I used to be jealous over book blogger ARCs. They get all these free books! That is so freakishly cool…but wait. They don’t even read them all?! WHY ARE THEY SO UNGRATEFUL. Now that I’ve been book blogging for over a year, I learned things. Peoples: there are so many books. Book bloggers get given books unsolicited. Maybe it’s a sequel of a series they haven’t read yet. Maybe it’s not their genre. (Heck, I get too many fluffy contemporaries and sometimes I cry, because I don’t like fluffy books!!) Don’t think they don’t appreciate and love their books. 99.9% DO LOVE THEIR BOOKS. They just run out of time to read. The average person reads one book a year. Give us a break okay. 7. Be rude in the comments. This is just dumb. Just because it’s the internet and you can’t see their face, does NOT mean they don’t have feelings. We do. Sometimes meanness makes us cry. 8. Spam them with invites on Goodreads…or via twitter, or facebook, or email. I had to turn off my Goodreads invites. When total strangers tell me to read this book, enter this giveaway (usually one I couldn’t enter anyway because it wasn’t for Australians) and join this group? I just want to bury myself. If I don’t know you, it probably smells like spam. 9. Let spoilers run wild and free with no warnings. Please, someone explain to me why it is that people think that EVERYONE has read a book?! I can guarantee you that not everyone HAS READ THE BOOK ALREADY. It’s okay, I’m fine. I’m not steaming out of my ears. I’m calming down now. I’ve had whole series ruined for me by someone off-handedly leaving a spoiler (with no “spoiler warning” labels) in a post. Or a tweet. Or in a comment. 10. Tell them how much you hate their favourite book. Like I said earlier: I expect people to disagree with me. DO IT! It’s fine! What I can’t stand, though, is when someone launches into a rant in the comment section of just how much they HATE a book I’ve just said I loved. Dude, obviously I’ve made my point in the post: I love this book. You’re pretty sad if you’re trying to make me hate a book. Just don’t comment if you hate the book I love so much. i want to hear YOUR opinions on my 10 steps, by the way, peoples. and add to my list! any ways to make a blogger furious that i’ve missed?! Cait never gets mad. Ha! That’s hilarious. Of course she does…she gets extremely very mad if she accidentally ruins a book (like bending the cover or smudging sticky fingers on a page) and she won’t deny her hackles rising she goes to eat an avocado and it’s rotten. Nasty avocado. So rude. So unfeeling to her pain. Currently (after a helpful twitter poll) she is reading The Knife Of Never Letting Go. I quite like getting review requests, and I have my contact info up for that reason, but I do get REALLY annoyed when the book has nothing to do with my blog and is a genre I never read. I understand PR reps have a job to do, and that job is getting good reviews, but I usually think they’re better off saving the time and looking for a better fit than annoying bloggers with unwanted emails.